“Watch out, you won’t be partying every weekend once your wife gets here” his friends told him. “You’ll do so many fun things once you’re finally together” my friends told me. They were all a little wrong and a little right. Inbetween getting legally married, finding and moving into our first apartment, trying and failing multiple times at getting me a driver’s license, getting me insurance, a bank account, a library card, a social security number, etc. – there wasn’t all that much time to get bored. And with him working 14 hours and me working virtually zero hours a day, his and my need for out-of-the-apartment excitement vs. no-further-than-the-couch downtime don’t always match. Interestingly, it’s not always my workaholic who is drawn to the couch and not always me who wants to go out. In Munich, all drinks and food are horribly expensive. 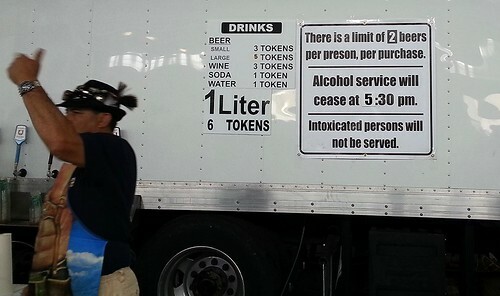 In San Francisco, food and drinks as well as parking and tickets are horribly expensive. Come to Oktoberfest, but don’t drink too much. That’s not what it’s about. Right? … RIGHT? There is an actual dance floor at the Bayfest that not only serves for dancing (like I’ve never seen anyone dance in Munich) but also for cute show numbers from the host club. 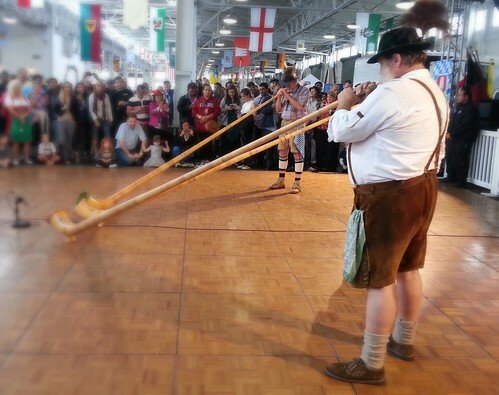 They put on a little play, chopped up an actual wooden log, and even threw in some Schuhplattler and an Alphorn trio. Who cares if that’s more Swiss than Bavarian – they brought the sound of the alps into a San Francisco harbor hangar! To my surprise, however, the music was surprisingly authentic. In Germany, I never cared for traditional brass music. But as an expatriate, you suddenly find yourself missing things you had nothing but disdain for at home. Their Musikkapelle sounded so much like a German brass band that I’ll even forgive the description “sizzling oompah music” on their website. The new-world Oktoberfest style – as long as you’re having fun! The food was less delightful than the entertainment: Bratwurst or dry Schnitzel on very flimsy bread rolls, made extra-soggy by sauerkraut I didn’t even try, deep-fried pickles (no idea who came up with that), fries, salad with nice and heavy ranch dressing, and little plastic flasks of Underberg for the digestively challenged. Would I go again? Probably not. But not because Oktoberfest by the Bay is bad. On the contrary. Given the very different cultural setting and regulations they surely had to work with, they managed a marvelous recreation. But I’ve learned one thing: If you’re homesick, don’t chase after foreign interpretations of what you miss. Better to embrace the things only your new culture can offer, and keep an untarnished memory of home. This entry was posted in Adventures and tagged Activities, adventure, couple, Dirndl, homesickness, Lederhosen, married, night out, Oktoberfest, San Francisco. Bookmark the permalink.